COCAL is the Coalition of Contingent Academic Labor, a nearly 20-year-old network of contingent activists and their organizations that does a conference (now tri national – USA, CAN, MEX) every other year, usually in August. It also sponsors a listserv, called ADJ-L, and has an International Advisory Committee and a website and Facebook page. 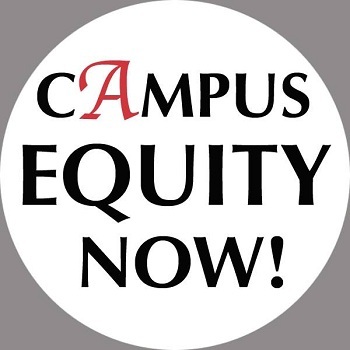 CAMPUS EQUITY WEEK 2015 – Hi Everyone, I just finished listening to the planning meeting on the upcoming Campus Equity Week 2015 (Oct. 26-30). I will see whether I might be able to give you a recording of this meeting soon. You can access information both on facebook and here. 1. AFT 2121 response to CCSF economic proposals in bargaining. 2. The comment period to the Federal government on the ACCJC’s review of its performance as an accreditor is now open for 2 weeks. This is IMPORTANT! NACIQI meeting has been announced. It will be on December 16,17, & 18. Check out the Save CCSF Webpage. 1. Adjunct faculty; the workhorses of Washington U (St Louis, MO). 2. Columbia U (NYC) adjunct in Arts and Sciences salaries range from $4,500 to $15,000. 3. Questions for all racism-denying politicians (and some, unfortunately, in the labor movement). 4. Turns out unions are good for the next generation too, even 30 years out. 5. Another research paper showing how unpredictable work schedules are bad for humans, especially female humans. 6. New research on “alternative” work arrangements. 7. Can millennials save the unions? 8. Tompkins Cortland CC (NY) adjuncts fight for an independent union. 9. Another adjunct dies from lack of health care, among other things, at Seattle U. 11. U of WA faculty head toward unionization, Prez “has reservations” (surprise!). 13. Hiring spree (FTTT) at CA CCs, but no mention of any preference for existing adjuncts. 14. More fight in SEIU over presidential primary endorsement. 15. Seattle teachers strike shuts all schools. 16. Immigrant contingent deli workers fight for union and contract in NYC. 17. Labor for Bernie fights against early union endorsements. 18. Essentially an ad for adjuncting directed to professionals in FL, disguised as a news story. 19. From the adjunct faculty campaign at U of MN. 20. Hooters workers win at NLRB throwing out mandatory individual arbitration clause in their hiring agreements. 21. Fight for $15 is creating a labor movement for the 21st century. 22. U of Iowa faculty look at unionization after business man hired as new president over nearly unanimous faculty objections. 23. Nation Opinion: Was labor’s total massive support of the Wisconsin recall a mistake? and views on the perspective for the future. (reprint of older piece) from Jane McKelvy, Bill Fletcher, Doug Henwood, and others. 24. Stop Precarious Work, Day of action for decent work, Oct. 7, 2015, from Industriall (International labor union). NOTE: As noted previously, your COCAL UPDATES editor (Joe Berry) and his spouse/partner/colleague Helena Worthen, are teaching labor studies in Viet Nam for the fall 2015 Semester. Unions in Viet Nam are grappling with how to deal with the influx of foreign (capitalist) direct investment there and the need to build local unions that can effectively fight for workers in this new context.